This fungi was growing in the ground against an elder tree trunk in a lawn. 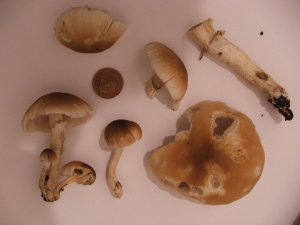 The cap is creamy brown, but is darker towards the centre. It has the appearance of a well baked white bread roll. The stem is creamy white, hollow and fibrous with a thin ring that seems to dry out quickly. The gills are creamy white and strongly decurrent. The spore print is mid chocolate brown.